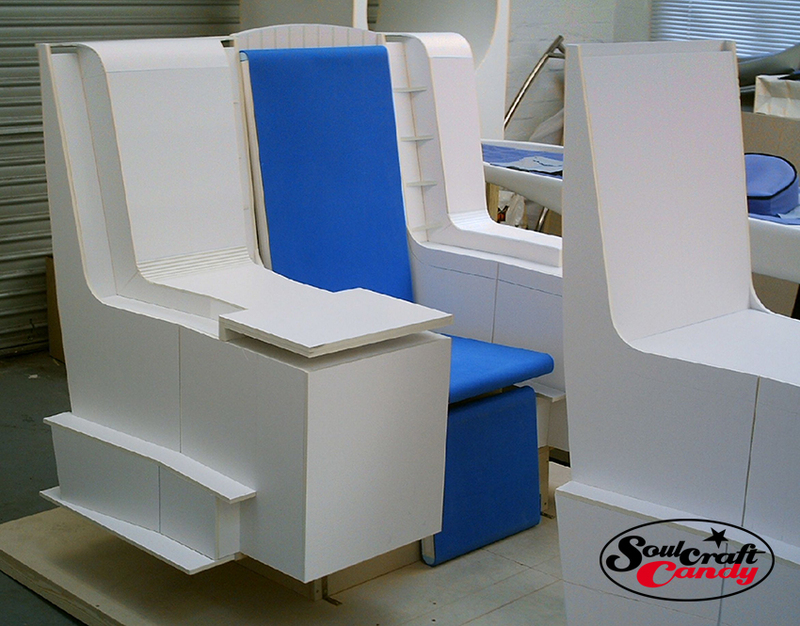 Ok, so there’s been a bit of a gap between this and the last post, I’ve been working, putting in some serious time on a freelance job, one which involved constructing a couple of full sized mock ups of some new airline seat concepts, in polyboard. For those of you who don’t know, polyboard is that stuff that folk normally use for presentations, a couple of sheets of very thin card with a foam core. It’s great for what it was designed for but, it also makes a great modelling material provided you know what you’re doing. I’ve been making models out of this stuff for longer than I care to remember so it presents few challenges as such, the main obstacle these days is that the forms that are created in CAD by the designers are so complex that we are now operating well beyond what a basic sheet material can achieve. Fortunately there are ways around this, including software that essentially creates complex nets for making paper models, which can be utilised to assist in turning curved surfaces into flat plates that one can cut, bend and glue together. It’s hard work, but becoming a skill fewer and fewer people possess, so there may be hope for me yet! Here’s a pic of the kind of thing I’ve been building. This is a very old model so no one will mind me showing it, the more recent stuff is, as usual, highly confidential so no pics of that for a few months at least. Anyway, enough about work. Todays post is actually about this sketch above, the next stage in creating the drawings for Mr. C. After my initial efforts, see the relevant post here, it became obvious that what I wanted wasn’t anywhere near what I’d initially drawn so was beyond a quick set of modifications. Only one thing for it, redraw the whole thing. Not a problem, the learning and critique of the first sketches really informs your hand second time around so the process is more focused and as a result much better. What I do find though is that I can’t force this part of the process, it has to happen when the mood takes rather than when sitting down and telling oneself to get on with it. Needless to say the use of the magic blue biro helps as well, laying gentle lines first and slowly building up. This is now much more what I’m after in terms of view angle, the position of the bike on the page, the curve of the road and where the police car is. 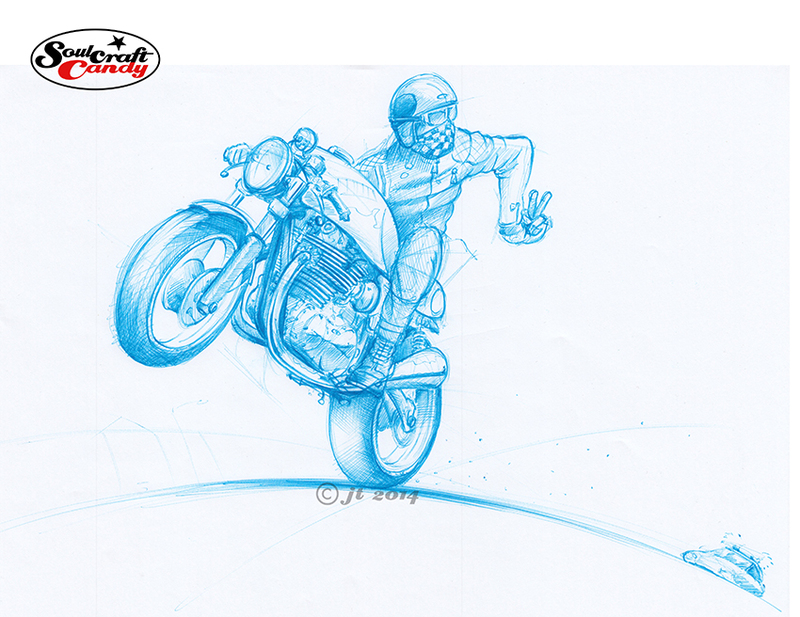 This will now get transferred onto Bristol board for the final bit and I’m already thinking I should do another version in tandem which shows a motorcycle which is closer to the kind of bike Mr.C constructs using four cylinder engines. More very soon, and thanks for taking the time to read the post today. Today I drew a car! I’m currently working my through a small book I bought recently about creativity. Needless to say I find it extremely interesting. The book is called “12 Rules of Creativity” by Michael Atavar, you’ll find it here. In the opening chapter is some stuff about training your eyes to really look at things, to really see what’s in front of you. What’s this got to do with drawing this car? Well, I’ve tried a number of times over the last few months to get this picture underway, and each time I have utterly failed to capture it in any way that was remotely close to what I was looking for. Realising the other day that it would be a good idea to have another go, I thought I’d read that chapter in the book again before picking up the pen. By reading the pages and looking up at some photographs I’d taken of the car on the computer screen, it was suddenly much easier to see what I was looking at and, see in my minds eye the composition of the image I wanted to create. Funny that. I’m not exactly sure how it worked but some connection in the brain suddenly got made, and forms that I’d struggled with previously seemed to be more easily understood. Once I’d established an eye line and got my head around the extreme perspective the sketch progressed fairly quickly, though I did have to have a couple of goes at getting the wheel angle where I wanted it. Consequently I’m pretty happy with this first drawing, which I’ve done in my favourite blue Bic biro on a very cheap sketch pad. It will go onto the light box next so that it can be traced onto some watercolour paper ready for painting and inking. Ultimately the picture is going to be a gift for my friend Christophe in France. We will be visiting him next month for a house warming party, so I’m hoping he’ll like it and put it up in the new place. He’s a confirmed petrolhead, and this is him in his beloved Mustang, a car I can only describe as a ballistic tank. A couple of posts ago I put up some colour photographs of a lovely red vintage drag bike called Shotgun. 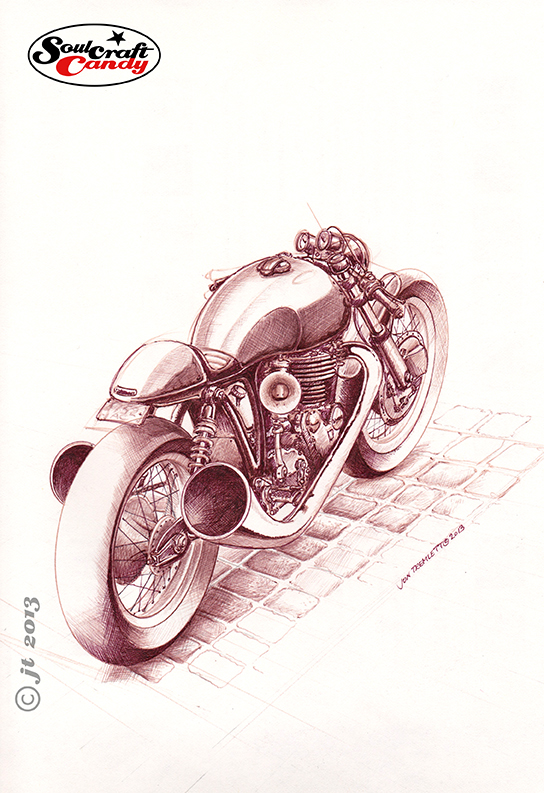 I’ve been asked by its owner, Nik Fisk, to create a picture of the bike for him. 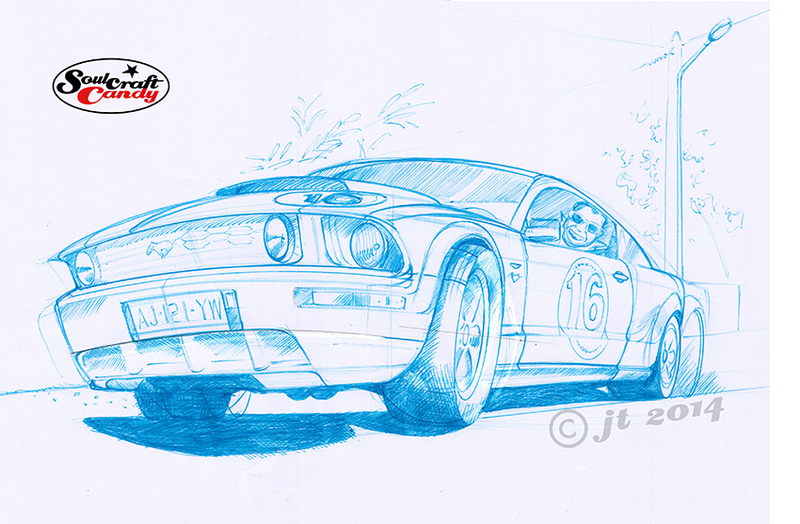 It’s taken a couple of weeks to get going but here is the first layout sketch done in preparation for the final picture. It’s done in black biro on heavy weight lining paper. When I was taking the photographs we discussed in some detail the view we wanted to achieve in the finished piece, something that hinted at the length of the bike, but also showed off the overall shape well and the fantastic old Triumph engine that sits at the heart of the beast. Having the right hand exhaust pipe nearly vertical we reckoned this would allow the curvature of the left pipe to be a feature and would also create a strong central element to the picture. It would be far simpler, and probably much easier, to sketch directly over a printed photograph, or do it digitally using something like Corel Painter, but that would defeat the object of this exercise. In asking me to create a picture for him, Nik is looking for something created in a particular style, which we reckoned would be called something like “factual caricature”. This is not about creating a facsimile image, more about giving the image a degree of character which a photograph just can’t do. So with a picture up on the screen as reference I like to work freehand directly onto the paper, working out the relative positions and proportions of things as I go. It’s a rather organic process, one which not only makes you look carefully at the subject, but also embeds knowledge about that subject into your minds eye as you go. I find this part of the process invaluable and it enables me to make the slight scale and proportional changes which bring the caricature into the image. It allows me to do things like make the engine slightly bigger and bulk up the exhaust pipes to increase the sense of power of the unit for example. I always like to increase the fatness of tyres on bike pictures, in makes them look more planted in my view, but at the same time I need to make sure that the ellipses that outline the wheels are as correct as possible. This sketch shows a revised front wheel from the original sketch, done with some ellipse guides at a smaller size (my templates only go so big), rescanned and photoshopped into place. So when I’m freehanding the outline drawing for the final picture I’ve got some decent guidelines to work to. 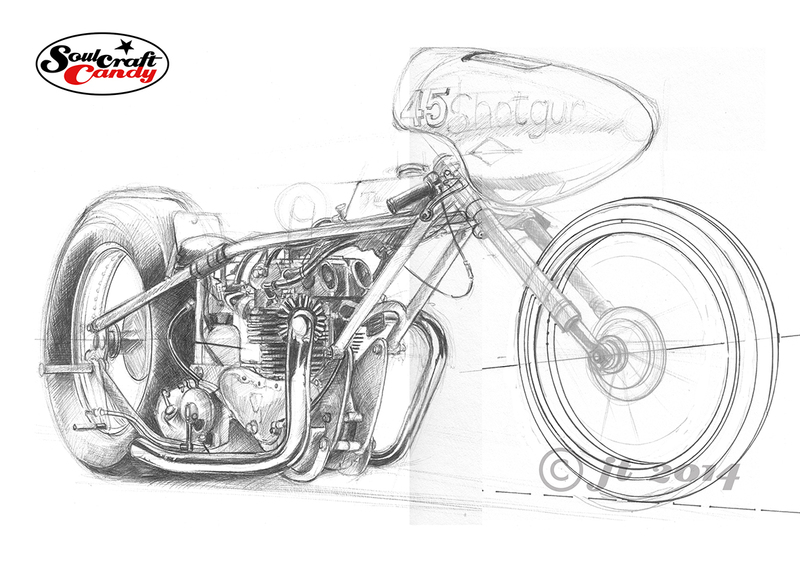 The drawing is about 380mm from the back of the rear wheel to the tip of the front and sits very nicely on an A2 sheet, so a really good size which will allow lots of details to be shown. The next step is to check over this one, make some notes for adjustments and then use the light box to start the process of getting it onto the Bristol Board I’ll use for the final painting. This is going to be a lot of fun and I’ll be posting progress reports as things take shape. The finished thing, blobs and all. Those of you who’ve followed the blog for some time will know that I have a thing for a ball point pen. I have my favourites obviously, just like painters tend to have a favourite brush or colour, but generally speaking it doesn’t really matter what brand it is or how cheap. In fact some of the best for drawing are amongst the cheapest you can buy. Although I tend to use black mainly, there’s nothing wrong with other colours, they bring a certain something to an image. But I digress. This drawing you see here must be one of the messiest I have done for quite some time. I have no problem with this, in fact it was a joy to make, really, and it was made using a ball point pen. Well, I’ll call it a pen for now, but in fact it’s more of a marker and actually I used two different types to make the picture. 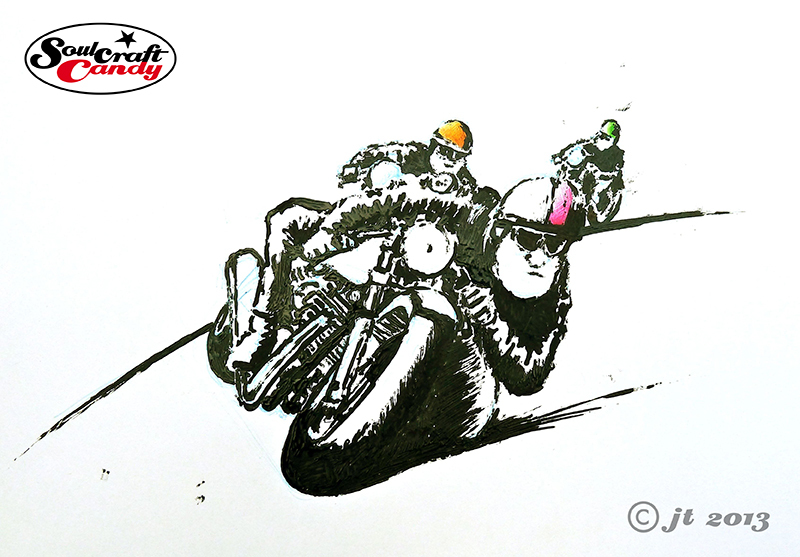 You may remember some time ago I posted that I’d had a sketch of one of the original Cafe Racer drawings printed out at life size. The resultant print, taken from a scan of a loose biro sketch, revealed all of the feathering and broken line work that were not really visible on the original. It looked great, one could really see where the pen had travelled and what marks it had left behind. On the back of this experiment I wanted to investigate whether I could create a giant ball point pen to try and replicate this character and do some massive drawings at life size. Scaling things up I needed to find a pen with a ball of roughly 3.0mm in diameter. My searches unfortunately proved that no such thing existed but something very similar did. What I found were ball point paint markers which are used in the construction and engineering fields for marking parts and assemblies. Finding a convenient supplier in Royston, Hertfordshire I duly bought a couple to try. In black. Detail showing paint build up. Both of the markers are shown in the bottom picture. 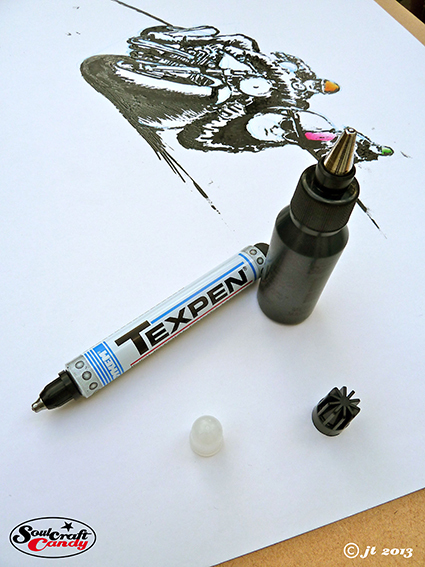 The first, a thing called a Texpen made by Dykem, is a fairly conventional looking marker and quite easy to hold and manipulate. The other is a more heavy duty one from a company called Suremark. As you can see it’s essentially a bottle of paint with a ball point cap screwed onto the top. Lasts longer but not so easy to handle, and is refillable. Before venturing into huge scale and wrecking large pieces of paper I thought I’d try something smaller to start with, to see if my suspicions were correct or not. The picture you see here is on a piece of A2 cartridge paper. I roughed out a sketch in blue biro first and then hit it with the paint markers. After half an hour of struggling I had to get up and have a cup of tea whilst I coped with my disappointment. After sweet tea and swearing I sat down and tried again, and this time really enjoyed myself. These things are not like ball point pens at all, no sir. Firstly the paint is thick, gooey and doesn’t really flow. Secondly, the balls in the nibs are spring loaded so you have to press down to release the paint, so describing a line in a sweep is virtually impossible. Once I’d got my head around mark making though, I found I could squidge and blob my way to creating an image without too much trouble, the key bit was realising that detail and line consistency were never going to come to this party. It was a great lesson in learning how to approach getting the best out of an unfamiliar tool. The paint takes a short while to dry so avoiding putting your drawing hand in it is quite difficult, hence various blobs scattered about. The bottle option proved best for filling in solid areas while the pen option was easier to “draw” with. You can see from the detail shot, I hope, that paint tends to build up quite a bit on the blackest areas. I stopped at a point beyond which I thought I might spoil it, and let it dry. When I returned I wanted to give it something extra so grabbed some cheap coloured biros I have here and put some colour on the riders helmets to lift the whole thing a little. I hope you like it. This isn’t the end of my experiments with these markers, there are different papers to try in the search for different results and different types of drawings to try too. All very exciting, I’ll let you know how I get on. For those of you who have been following the saga of the large biro drawing, known around here as “The Bull”, you will note that todays offering is not it, it’s something else, something a little different. Why? Well to be honest with all of you, I’m having a bit of a battle with it, and as a consequence it remains unfinished. I’m beginning to wonder who the bull really is. It is truly the drawing or perhaps it’s me, as I find myself repeatedly charging full pelt at a gate which is refusing to give way. A concerted effort last week to resolve the impasse bore nothing but a large pile of scrunched up tracing paper, wasteful certainly, and enough to provide bedding for a hamster for about a year. I have since decided to leave it alone for a while. Having got utterly steamed up about it, backing off and calming down has led me to realise that this conflict is nothing new. It is one of the uncomfortable truths that surround any creative process. It is certainly not unusual to find oneself completely bereft of ideas during a concept design phase in the studio. Having “brain dumped” for several hours in a morning it is not a surprise to find out that your mind is totally empty and your imagination has gone walkabout. The energy previously expended in generating new ideas gets refocused into frustration and before you know it you’ve got a nice little vicious circle going. Backing away, doing something else for a while unblocks the pipes and lets things flow again. So for now the drawing is sat on the other side of the room, the recipient of the occasional glance but nothing more. It will come to me when it’s ready, but probably not before. So what’s with this brown thing? Well, it’s a sketch I made a while back, always good to have a back up plan for a post if things go awry, whilst playing with the idea of drawing in other colours. Being a sucker for a cheap pen I’d purchased a tasteful set of biro pens in assorted colours and was intrigued by what they might bring to the party. Initial scribbling revealed that some of the colours, yellow in particular, might not be strong enough, but the brown showed immediate promise. 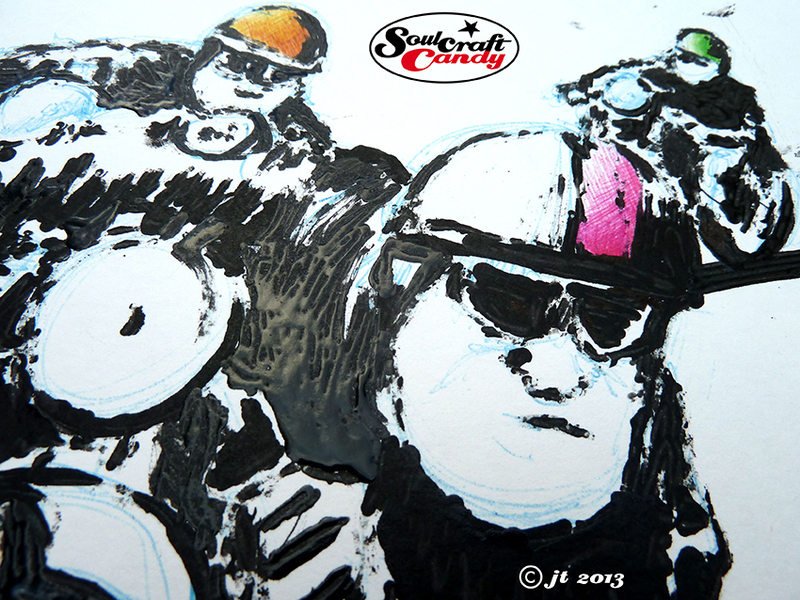 You may remember the cartoon of the authentic biker a while back, that was done with this pen. The basic pen itself gives the drawing a lovely aged feel but it’s a bit limp when it comes to creating good contrast. As luck would have it I’d also found a brown gel rollerball pen, which when used with the biro gives a degree of heft to the dark bits and lends the whole thing a much needed punchiness. This is very much a learning exercise but one that worked out well. Now to get my hands on some cream coloured paper and find out where I can get brown biro refils without the need to buy a whole set when it runs out, which it will, soon.